“Twenty years ago, the impossible became possible. We achieved what was considered unattainable.” So spoke former Polish premier Tadeusz Mazowiecki yesterday of the elections that dethroned the communists on 4th June 1989. Today, leaders from across Europe gathered in Krakow to honour the world-changing events of 20 years ago. It was a decidedly drippy morning for a celebration. But mercifully, the rain petered out for the commencement of the ceremonies at midday. “We are here to honour the great ideas of freedom and solidarity,” said Polish Prime Minister Donald Tusk before a crowd of dignitaries at Wawel Castle, former seat of Poland’s monarchs. The Prime Minister saluted those who could no longer be present, but who had nevertheless played a paramount role in the path to democracy, above all Pope John Paul II. However, the premier also praised the unseen faces that had made the revolution possible: “I would like to thank all Poles for this great gift of freedom,” he said, acknowledging the millions of ordinary citizens who had backed the Solidarity surge. Lech Wałęsa, icon of Solidarity and veteran of the Round Table talks that transformed Poland, also made a short but succinct speech. Former Czech President Vaclav Havel, a counterpart of Wałęsa’s in the struggle for democracy, spoke of the “inspiration” of Poland to himself and his country. He also highlighted that the concepts of solidarity and freedom remain vital, citing the dilemmas in Burma and North Korea. German Chancellor Angela Merkel echoed Havel’s sentiments, remembering another, more sombre event from June 1989 – the massacre in Tiananmen Square, Beijing. 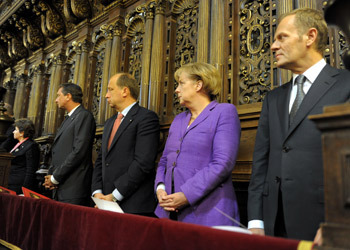 Other Central European leaders who spoke included Ukrainian Prime Minister Yulia Tymoshenko, and Romanian Premier Emil Boc. Later this afternoon, the focus will shift to Gdańsk, where a conference about the role of Solidarity is being staged. This morning’s celebrations were also supposed to have taken place in “the cradle of Solidarity.” But in a bitter twist, the threats of protests by shipyard workers prompted Tusk to transfer the event to Krakow.